Fall gardens provide many delights. You’ve heard “fall is a great time for planting” but perhaps you haven’t been told why. Obviously, the time to plant annuals and most vegetable crops has passed, but fall is indeed prime planting time for native perennials, shrubs, and trees. At Edge of the Woods we see autumn as a wonderful season in and of itself (only being an “end” to the heat and humidity). We have a great selection of late season perennials just starting to bloom, which are valued by fall pollinators. What’s so Great About Fall Planting? Just like spring, fall is cool and usually has more consistent precipitation. Fall planted trees, shrubs, and perennials will continue to put on root growth until winter dormancy, and then again in spring, giving them two cooler growing seasons to establish before the heat of the following summer. Did you know that if you plant a spring flowering plant in fall, it will likely be larger and more floriferous than if it were planted in spring? This is because it had so much more time to establish and didn’t experience transplant shock just before bloom time. Many references will suggest that the planting of hardy perennials and woodies should be done 4-6 weeks prior to first frost in order to ensure they can establish before winter. However, even though this a good rule of thumb to ensure the establishment, it does not mean these plants can’t be planted up until or even after the first frost. Let’s back up a moment, what exactly does “established” mean and why is it important? An established plant simply means it is rooted into the surrounding soil. If you plant a perennial, and tug on it only a few days later, it will pop right back out, because the plant’s roots haven’t “rooted in” to the native soil. Now, tug on that plant a few weeks or so after planting, and the plant no longer pulls out easily. The plant, by this time, has had a chance to “root in” and the soil disturbed from planting has since settled. This is important before heavy freezes, because when soil freezes, it expands. Expanding soil through freeze/thaw cycles can cause a common garden phenomenon known as frost heaving. Frost heaving is when plants are pushed out of the soil during hard freezes, exposing their crowns and roots, leaving them vulnerable to freezing temperatures. Frost heaving can be lethal to plants, including perennials, shrubs, and trees because their roots are pushed out of the warm earth and exposed to harsh cold, leaving them to freeze, dry out, and die. A combination of loose, disturbed soil from planting, and a tight root ball lead to frost heaving if proper precautions aren’t taken. So, how can you prevent frost heaving? For starters, we recommend getting your plants in as soon as you can! The earlier you get them in, the least chance they will heave. However, us plant people just don’t know when to stop, and would garden in the snow if we could! So, for those late season, last minute shoppers, be sure to take a little extra precautions. Those include properly loosening the root ball. Let’s face it, pots are just round walls for roots, and as the roots travel around the pot they tend to form a circular root ball. Always loosen the root ball so that the roots aren’t all going around in a circle and will grow outward into your garden soil. (We at the Edge of the Woods strive to provide you with plants that are not excessively pot bound to make planting easier and successful). Also, always plant your new plant at the appropriate depth—the same level they were in the pot; don’t plant too deep or you could rot their crown, and don’t plant too shallow or they may heave! Be sure to firm the soil around your new plants, don’t leave it too loose (but also, don’t pack them in too tight either). Watering well to help soil settle and consider mulching. Mulch helps prevent heaving by insulating your soil, trapping in the geothermal heat. This keeps the soil at a more consistent temperature, preventing some of the harsh freezing and thawing that cause heaving. It’s easy to over-apply mulch — no need to go crazy!– avoid burying the crowns of perennials or mulching against trunks of woody plants. So, there’s about 4 more weeks left of good planting weather! We have a very large selection of native ferns, grasses, perennials, shrubs, and trees that would love to find homes in your gardens before this winter. Stop on by, see what’s on sale, and check out our newly released crops. 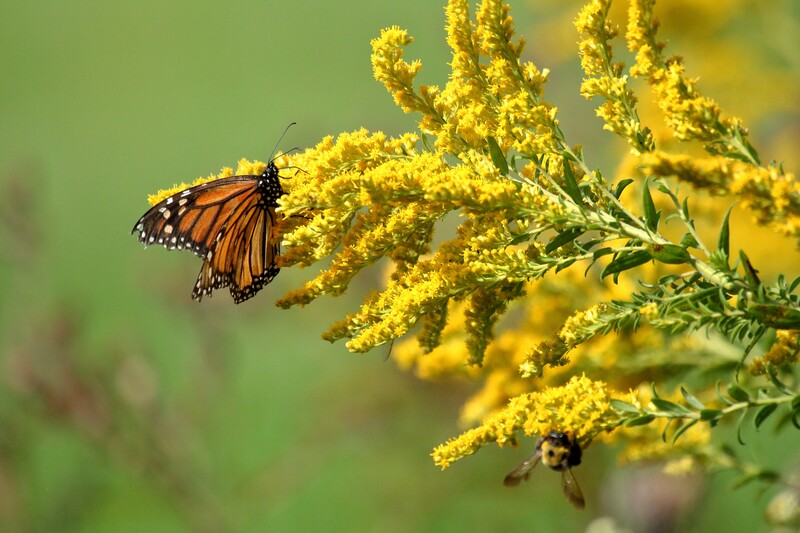 We have pollinator plants, PA rare and threatened species, plants with fall and winter interest, plants for birds, butterfly and moth larval host plants, flowering shrubs and trees, shade trees, native edibles, and much more! Add some natives to your gardens and landscape today, our knowledgeable staff would love to help you—that’s what we’re here for. Remember, the best time to plant a tree was 20 years ago, the second best time is today.